When it comes to fantasy, “accessibility” is a watchword. So often, good ideas are buried so far beneath dry prose and leaden world building that they are scarcely given a chance to surface. It’s not so much a problem of an impatient reader as it is the impenetrable density that some authors thrive on. Brandon Sanderson does not believe in making the reader wrestle with his prose until the story gets interesting or until the bitter, bitter end; instead, he presents something readily palatable and understandable. 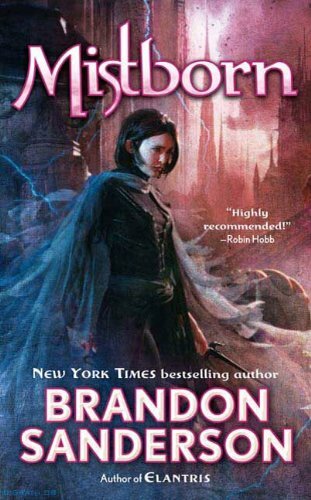 I will admit that my knowledge of the fantasy canon remains minuscule, but I would suggest that Mistborn: The Final Empire, the first in a trilogy, is a good book for beginners and veterans alike. One thousand years ago, the Lord Ruler took command and started The Final Empire, ruling like a dictator and plunging the land into ash. Now a team lead by Kelsier, a Mistborn – one in control of all of the metals that make up the magic of Allomancy – hopes to both overthrow the empire and steal its most precious metal. The Final Empire has been regarded as a “heist” book, and Sanderson himself says that this was its genesis but, as with so much else of the book, this quickly falls to the wayside. More than anything else, The Final Empire is a character study. Unfortunately a lot of the character work is based on baiting expectations and switching them out for separate outcomes, but this generally works in Sanderson’s favour. Characters that you might expect to take the lead, such as Kelsier, get thrown to the wayside so that the real hero and heroine can come to the fore. The two best and strongest characters are the real heroine, Vin, and her offsider, Sazed. Vin is an orphaned thief who turns out to have more power than she ever knew was possible (the caste system preventing the underclasses from knowing how the nobility work), and Sazed is the retainer assigned to her when she pretends to be a noblewoman herself. Vin is the obvious heroine, as Sanderson makes half-hearted attempts to switch point-of-view from her to Kelsier and eventually resigns himself to the fact that, while Kelsier is important, this is ultimately Vin’s book. It’s hard to read her character without taking it in an at least slightly gendered way, and I had to fight to read the last line as if her feelings were human rather than “inherently female”. Gender differences exist, yes, and Vin’s portrayal isn’t sexist, but on at least two occasions I had to stretch my interpretation of the character to make sure she wasn’t acting within the parameters of a stereotype. Apart from that, though, Vin is a great character and she can carry the book easily. Her concerns, and the character herself, generally and genuinely feel real – or as real as a girl who can throw herself across miles on the currents of metals can be. The romantic storyline feels a bit forced, but I say that about most books that I read. It doesn’t make it any less true here, but it also doesn’t detract from the character or her overall arc, which is most satisfying. The ultimate best character, though, is Sazed, who is grand without having to do much to be demonstrably grand. It’s just a given. He appears periphery, but just you watch him: his development is one of a myriad of small delights that Sanderson has seeded throughout the book and, presumably, the entire trilogy. The other characters don’t fare so well, with the majority of Kelsier’s team being largely one note. They’re not needed to be anything more, and they may pay off in later instalments. It’s not much of an issue here because the most important characters get their due and leave little room to complain on that front. The magic system bears mention for its internal logic and for the fact that no one would likely think that the consumption of metal was a suitable catalyst for the exercise of magic powers. Combined with a world that needs to have much of its history explained outside of the epigraphs provided with each chapter, there’s ample reason to read on past this first book. Outside of his characterisation and world building, the strongest thing that I can say in Sanderson’s favour is that he is an author in full command of a climax (checking his annotations, he refers to it as the “Brandon Avalanche”). The second half of the book far exceeds the quality of the first, and the final quarter is leagues ahead of the remainder. That’s not to say that the book as a whole is not worthy, but that Sanderson believes in developing excitement in the right direction. It is better to get off to a fine start that builds to an incandescent finish than to offer a brilliant start that peters out into nothingness. At 643 pages in paperback (and at almost 13,000 locations on a Kindle), it might initially seem daunting but the level of momentum behind Sanderson’s writing is such that it can be knocked over in no time at all. It’s strange to speak of momentum when, for a lot of the book, nothing appreciable really happens: Vin goes to a lot of balls and socialises with the nobility for the majority of the book, only occasionally stopping off to train or visit secret armies or what have you. This structure and narrative imbalance should be a cause for concern but it somehow isn’t. Not every page is equally important, and this is okay, because the subtle build up to a rousing finale really pays off, and we end up with something vastly more satisfying than the heist novel originally promised. Part of the reason I have to knock this review out is so that I can start the next book, wherein Sanderson promises “things get hard from here on out…” That I can scarcely wait, although I forced myself to read something else in between, is probably the highest praise that I can heap upon The Final Empire. A definite and easy recommendation.